Entertainment in the rear zone of a vehicle – the passengers on the rear seats can watch a DVD movie or play a videogame via a monitor and a head set, while the driver comfortably navigates through the city or listens to his favorite CD or the radio. 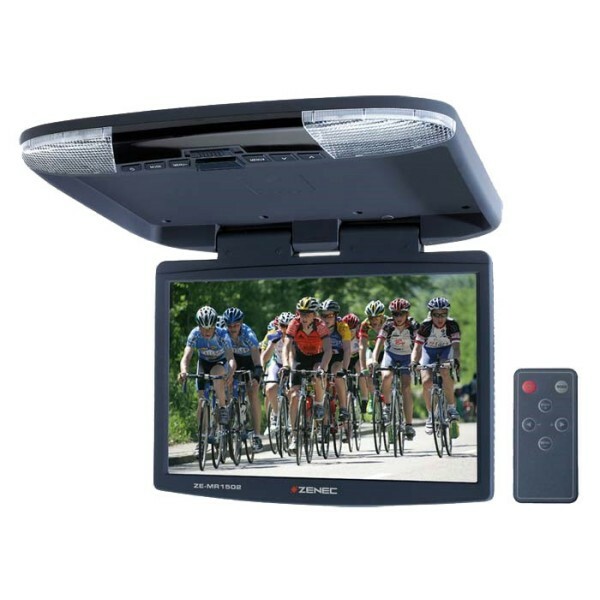 ZENEC ZE-MR1502 high-resolution roof mount monitor provides an excellent cinema like experience: flicker-free, extremely sharp and high-contrast pictures on the road and in each vehicle. The ZE-MR1502 is intended for use with all Screens, Sat Nav, DVD players or DVB-T tuners, which are equipped with an RCA A/V output. ZENEC's extremely compact, flat, easy-to-install monitor attaches to the vehicle‘s ceiling and can be flipped down when needed – as in airliners. The ZE-MR1502 is also suitable for mounting in mobile homes, caravans or even buses. ZENEC ZE-MR1502 roof mount monitors can be set up directly using the onscreen menu or with the separate IR remote control.